Save money, reduce frustration, and keep stuff cold longer. This amazing hot and cold pack features advanced technology that allows it to stay ice cold for days, and when it finally warms, there's absolutely no release of water. This means that food and beverages will stay fresh inside your cooler, and you never have to worry about saturated packages, gooey labels, or soggy bread. Simply get wet with water to activate the cells, then cool or warm as needed. When frozen solid it makes the perfect alternative to ice packs and regular ice, and it even gets cold enough to replace dry ice. When warmed, it can maintain the temperature for a long period so it's perfect for heat therapy to soothe sore muscles, or for keeping hot beverages and cooked food usable for longer. Each sheet is comprised of 24 individual cells so you can cut it to any size you need, and each portion you use can be reused over and over again. The flexible sheet can wrap around objects, or conform to unusually shaped containers, so it's fully adaptable to almost any situation. Once you're done with it, toss it back in the freezer to use again later. With enough inside, they will reduce power consumption and make your freezer work better. Looking for something that's more durable and long-lasting? Then check out the 4 Ply HDR Version. It works just as well to keep stuff warm or cool, but it has a plastic coating on all sides, so you can use it over and over without worry or special precautions. Cell Size 2.25" x 2.25"
Capability Can be used as hot or cold pack. Heat in microwave, or cool in freezer and it will maintain temps for an incredibly long time. Uses Preserve food and beverages, transport medicine and other perishables, treat sore muscles, reduce swelling and more. Re-Sizeable Yes. Use as few or as many cells as you need. Flexible Yes. Thanks to the multiple cells, the sheet remains pliable even when frozen solid. Ability Stays cold for days. Can be frozen colder than ice, and even colder than dry ice. Never sift through cold water to pull out soggy food again. These sheets will keep your cooler colder,they will last longer, and when they warm, they don't release any moisture. Use frozen to keep food, beverages and other perishables cold, or warm in the microwave for heat therapy, or to keep food and beverages warm. Order Yours Today! Love everything about this product!! Needed it for shipping perishable product and it was excellent. I just sent my first package with this and it seems to have worked to keep items from melting in this heat. I will order again! These ice packs stay cold for a very long time. Once filled, they freeze and re-freeze perfectly. Used on a sprained ankle and as a cool down method when outdoors in the summer heat. You can cut them to any size, and they still work great. Would definitely recommend. They freeze very hard. But they don't stay frozen for as long as advertised I don't think. Of course, I only use them for ice packs on my chronic hives which are pretty warm. But the I've packs get pretty wet talked they defrost and leave large wet spots everywhere. I like their size and convenience though. I have one that I left whole to cover larger surfaces and I cut the second one into smaller pieces for smaller places. Can't see them staying cold for days, but I have kept one out for several hours and it works better than any cold pack! Very happy I got these. And I love that I can trim to any size that suits me. I have only used this product once, on an overseas airline flight to keep my medication cool. It stayed frozen, then very cold for 13 hours. I soaked it for a long time, massaging it occasionally, until it seemed completely puffed up and full. I then put it in the bottom of the freezer for 24 hours with the fabric side protected from damage. These ice packs worked great and stayed cold for the two days in my cooler. I didn't have a problem at all with the preparation once I figured out what I needed to do. Thank you for easing the worry of waterlogged items and warm drinks. I have four of these paks and have used them three times. Two go into the cooler, and two into the refrigerator in the camper. The two in the cooler stay frozen for a a couple days. I can't say they're incredible or better than dry ice, but they do seem to be slightly better than ice. I put them into large zip lock bags and keep them in the freezer until use. great product. worked exactly how i had hoped that it would work! great buy also. would definitely buy it again from this company! 5 stars! Turning this flat sheet into larger full, fat ice cubes sheets is amazing. They stay frozen for an amazing long time. Okay - You get what you pay for, Not the best quality. 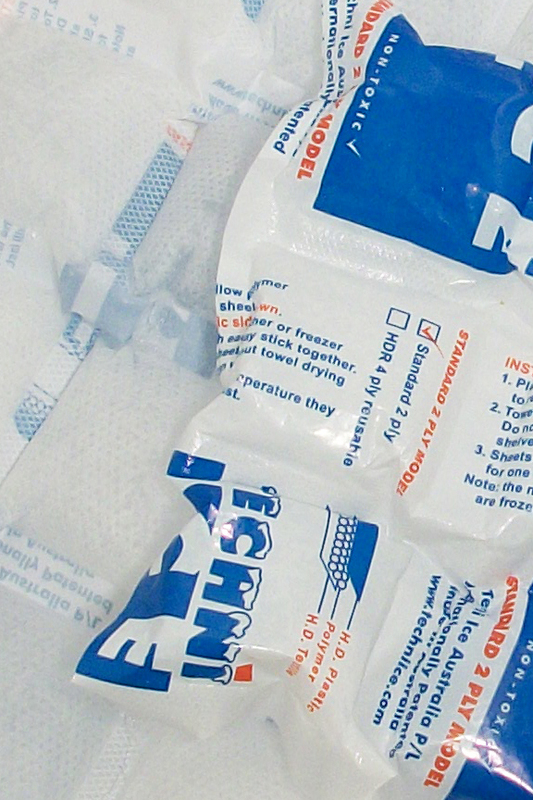 I didn't realize that there were reusable and non-reusable Techni Ice packs. I would have ordered the reusable ones. However, I have "reused" the non-reusable ones about 5 times and they work just fine. Maybe, the packaging will break after a few more uses and then I'll order the others. The Techni Ice stays cold close to double the time of my former ice packs. The didn't stay cold for a two hour car ride. Although I think your on-product instructions ought to make more clear that the thing needs a good soaking before you freeze it, once I figured that out it froze extremely thick and well. I think it's a good value. I was searching for an alternative to dry ice to keep ice cream frozen during a party in the park. Techni ice delivered as promised! I had 18 half gallons in a large cooler with 2 sheets on the bottom and two sheets on top. The party duration was 6 hours between setup, party & cleanup and I went home with frozen ice cream leftovers on a 90's day outside! I soaked the flat sheets in water as directed in jelly roll pans, dried them and put them in the freezer 10 days prior to the party. It says the longer they freeze the longer they stay frozen and it seems to be true. There was no condensation like regular ice blocks. You must keep the the Techni ice on the top of your frozen items as with any cooler procedure but I assure you, you will love this product. Did not live up to the hype. Does not stay colder any longer than any other common freezer pack. Great product. Worked great. Will definitely use again. Liked how you can cut into smaller pieces so that it fit better into our cooler. Kept things nice and cold. Thanks for a great product. My meds was kept cold and safe. Can these be refrozen? Or do you have a different type of cube that can be. I will be using them often. Fairly pleased with technical ice. The pockets are too small to stay as cold as long as they could if bigger. At least for chest cooler use. But the flexibility the small sections gives would be good for aches and pains applications. Were very pleased with this purchase. Our food stayed solidly frozen for two days. Best product to use for over 100 degree summer heat. Stays frozen all day in the cooler. Works great camping also. And the price is great. Great ice Packs! Freeze fast and hold The cold well. I like The ability to cut the packs to Size as needed. The cold pack stays cold all night. I have neuropathy and my feet burn so I wrap it in a hand towel and use it to keep my feet cool.I have also used one to keep food cold while traveling and it works then also. 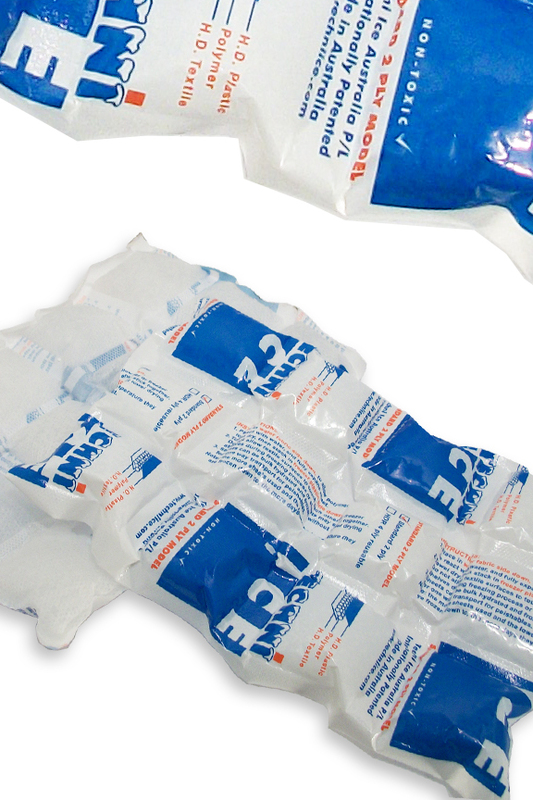 The advertisement suggested the icepacks would last for two days. I found they did not last longer than conventional ice packs or even ice cubes. simplygoodstuff response: Please make sure to freeze them thoroughly before use. The colder they are, the longer they will last. They will not remain rock solid frozen for days unless you put them in a cooler, but they will remain ice cold for a full day, even when sitting out on a table. How thick are these ice pack sheets? They will be paper thin when they arrive, but after saturating and freezing, they expand to one inch thick and stay that way. What is it made of? Are the materials toxic? It has a fabric cover on one side, and a plastic one in the middle. The center of each cell is filled with a NON-TOXIC polymer. What size is the sheet before they are cut? They are roughly 11" x 16"
how long do they last ? Meaning , how many times can they be used before wearing out ? You can reuse the same sheet many, many times. The exact number will be determined by how you handle it, but it is common to use the same one day after day, for months at a time. Several recent reviews have stated that the product being sold now is manufactured in China rather than Australia, and there are complaints about the product now (producing slime, leaking, etc) that were never made about it before. Is the product you currently sell from China or Australia (or somewhere else)? What light can you shed on the complaints about the Chinese product? Thanks. Not sure what shady website you have confused with ours, or which review you are referring to, but the Techni Ice sold by us is absolutely authentic. It is made in Australia. It will definitely work like we say it will, and thanks to the high quality, it will also last to provide long-time performance. Want to use this to ship cheese. Need products to stay cold for 2-3 days. Do you think this product will work for that? As long as you place the cheese inside a cooler or something insulated, it should work just fine. Do you also ship this item to Cebu Philippines? They do not leak when the warm. The amount of time they will stay cold will be dependent on many factors such as insulation, climate, item being preserved, etc. techni ice is also work with insulin? Sure. It is widely used for medical purposes. After you soak them in water the first time, do they ever need to be soaked again? Once you soak them, they are good to go, and will not need re-soaking. Just toss in the freezer when your done with it and it will be ready to use the next time. How long will these last in a cooler with a open top in room temperature after being frozen in a -35F degrees freezer? Exact length of time would be tough to determine without testing, and knowing what will be inside, what type of cooler you will be using, how often the contents will be handled, the actual room temperature and other factors. In general, with conditions like this, you can expect them to stay ice cold for 12 hours or more. I read that you have to use bottles water. Is that true or does tap water work just fine? Special water is not required. Plain old tap water works just fine when hydrating the sheets. What is the cleaning procedure? Are they dishwasher safe? When used to the point of being dirty, they are intended to be discarded and replaced. 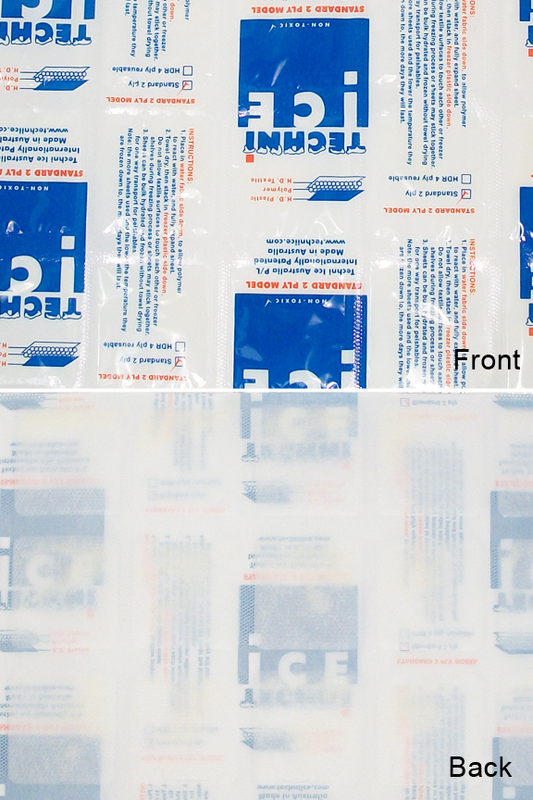 Does the polymer freeze like a flexible gel pack or a rigid block? What is actual frozen temperature of the polymer? Exact temp will vary based on the freezer being used, but when froze, each cell will be rock hard to the touch. The overall sheet will remain flexible due to the multitude of cells. Do you have 4 ply? Can you use the ice pack to take food on the airplaine? Yes you can. It's perfect for that use. Can I use these in a cooler bag to store breast milk while travelling by air. Does this product comply with air travel regulations for check-in of frozen items ? Yes. They work well for air travel. Are these safe for breastmilk? I am traveling and will need to freeze my breastmilk for the plane ride home. Breast milk will be in a cooler in my checked luggage. Second is - should i soak them here at home before I leave for the trip and have to deal with this at the hotel? Thoughts on that? Give them a good freeze here and then maybe test it on the way there? They are totally safe for this use, and it's actually an ideal application. If you only need them for the ride home, you could hydrate without freezing before you leave, then just store in a plastic bag until the day before your plane trip. Toss the saturated sheet into the freezer, then use the next day, and your breast milk will remain cold for the duration of your flight. I have multiple sclerosis. The heat and humidity in Arkansas is not my friend. I am doing my first MS bike ride this year. 150 miles in two days. My biggest concern is overheating. This ride is in the middle of September so you can expect triple digit heat and even higher heat index levels. I am looking for a product to keep me cool while riding my bike. I'm thinking I can cut a strip to go inside my bike helmet, and another to go in my seat. Is this product safe to be used right against the skin? I would of course have it in a fabric sl I appreciate any advice you can give me about the use of your product for this application. Yes. It's safe for contact with your skin, and thanks to the design, you can easily cut it into strips or small sections to cool any area of your body. Yes you can. They will easily last all day inside a cooler, even if you open it multiple times. This is not a recommended use. Yes. 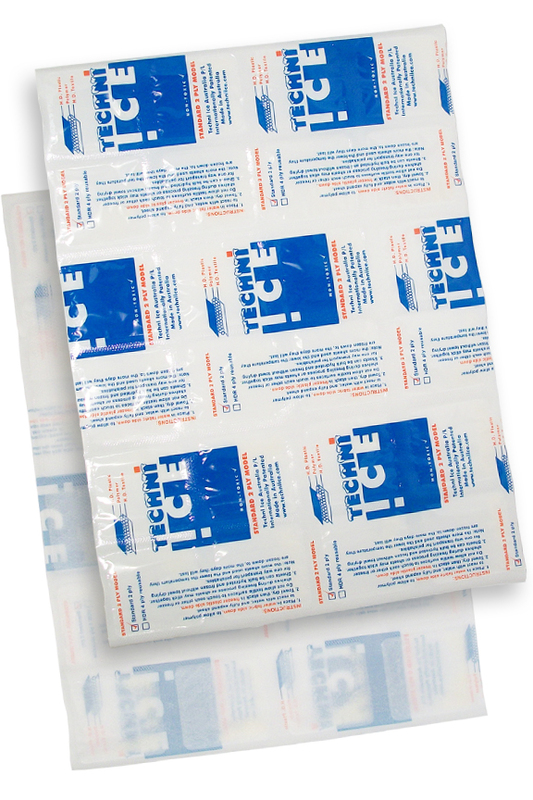 It is genuine Techni Ice and it is safe to touch. We do offer discounts for large orders, so please give us a call if you'd like to place an order. There are obvious sections within each sheet. You can cut on the lines to create the size you need, and it can be done before or after freezing. can these be used to keep cool (from hot flashes) on a warm day sightseeing in New York?? Under certain conditions, some condensation may develop on the exterior. They do not leak or get wet in general. How effect would this be for keeping medicine cold in the event of a major earthquake? It could be used to preserve medicine for several days when used inside a cooler. I wear a mascot like costume to conventions and want to wear this like a vest underneath the costume. How long will it stay cool if up against my body? It would be tough to provide exact timing without testing, but it will definitely provide a compact and long lasting cooling solution when used as described. I am traveling to the Philippines and need to keep insulin cool between 36 - 46 degrees for 48 hours. Will you product stay cold enough to keep insulin in that range in an insulated insulin carrier that does not need to be opened until I get to my destination? Yes. It will work under those conditions. Seems like a great product. I'm in school all day and need to keep my lunch in hot car for several hours (which might include canned pop). In hot sunny 90 degree weather will my food be safe and cold? Currently using a cloth lunch bag that is not insulated with gel. One of these sheets and any kind of insulated lunch bag will make a way better combo than what you're using now. If used properly, you can certainly count on enjoying a cold beverage with your lunch, no matter how hot the day is.